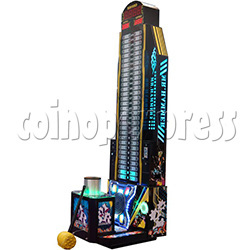 King Of The Hammer II Game Machine is a strength testing machine which players test their strength by the challenge hammer game, features with an accurate power gauge with 30 sets of super-bright LED's for maximum visual appeal and player / crowd attention. Player uses the hammer to smash on the cylinder, greater the intensity and higher of the LED indicator rise. Feature with one round have two chances to smash the power-gauge, and the end, if the total score is highest record will be displayed on the "RECORD" LED display of machine. - player insert coins into the coin entrance. - within the allotted time finish two times smash the power-gauge. - system statistics scores of two times, if the score is break the record, it will display on the game machine. - according to the scores, player get the corresponding tickets.